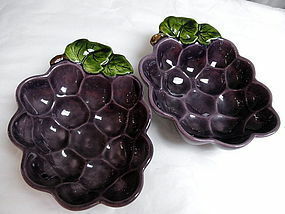 Pair of California Pottery Metlox Poppytrail purple grape cluster bowls. Colors are vibrant and they are in excellent condition each one measuring 7.5" x 6" x 2" high. Marked on bottom "Poppytrail, Made in Calif". Circa 1970's.